Halloween punctuates a very strange week. As fireworks crackle in the distance and the driving rain pounds my window – it is the Will O’ the Wisp that enters my pondering mind. Will O’ The Wisp, by definition – a delusive or misleading hope – is also known in folklore as ignus fatuus, and jack-o-lantern. Throughout history a mysterious glowing light that appeared over bogs and marshes. Folk tales from England, Appalachia, to Newfoundland describe “Will” or “Jack” as protagonists doomed to haunt graveyards, swamps, and marshes for the evil deeds committed during their lives. The first recorded attempt to explain the wisp was by Italian physicist Alessandro Volta in 1776; he attributed them to methane gas igniting over bogs and marshes. Many took issue as his theory couldn’t possibly explain why they seemed to move away as they were approached. Although his reasoning concluded that air was pushed forward by movement, exhaustive studies continued through the 18th and 19th centuries. There is still no definitive explanation. Theories from chemical reaction, electric energy, to refraction of light abound. 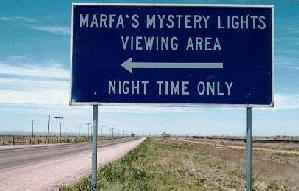 In Marfa, Texas they are attributed to car or train lights in the distance.